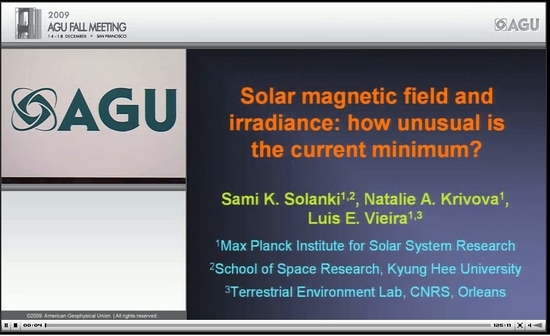 The AGU Fall meeting has a session entitled “Aspects and consequences of an unusually deep and long solar minimum”. Two hours of video of this session can be accessed here. Two of the papers presented had interesting observations with implications for climate. First of all Solanki came to the conclusion that the Sun is leaving its fifty to sixty year long grand maximum of the second half of the 20th century. He had said previously that the Sun was more active in the second half of the 20th century than in the previous 8,000 years. Here is the Video link from The ABC Network inc. footage of Piers Corbyn from 29th May at the "Last Friday of the Month" meeting at WeatherAction.Com". Look at the video and ask yourself just one question, can Piers Corbyn prove the Sun changes our climate and NOT Man?